In Mexico, corn bread, called pan de elote in Spanish, has a cake-like consistency and is at once savory and sweet, prepared with whole corn kernels, condensed milk, grated cheese, and only a tiny bit of flour. I first made pan de elote when teaching a cooking class for kids, and later decided to experiment with the recipe at home. I added ground black pepper, and rather than bake a rectangular corn bread loaf, I formed the dough into muffins that are perfect for breakfast or a snack. The recipe makes good use of fresh summer corn, but it’s delicious year-round with frozen corn kernels. 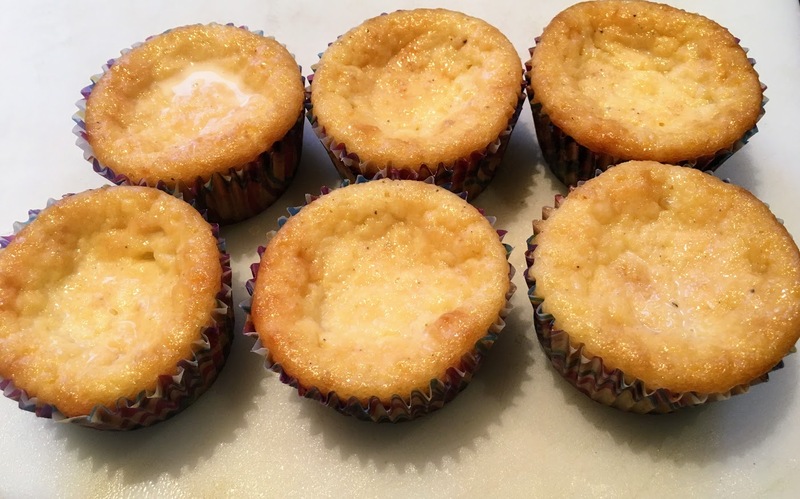 Preheat oven to 350º F. Grease a muffin pan and set aside. In a small bowl, combine flour, baking powder, salt, and black pepper. In a large bowl, mix together eggs, butter, vanilla, cheese, and half the condensed milk (set aside the remaining condensed milk for later.) Add flour mixture, and stir until just combined. Pour dough into muffin pan, filling each cup around three quarters of the way to the top. Bake for 25 minutes, until barely golden brown. Set aside to cool, then pour remaining condensed milk over the muffins. To store, refrigerate in an airtight container.